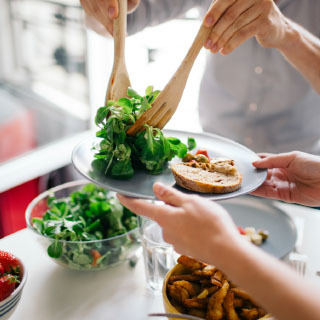 Chances are that you’ve heard the term “clean eating.” It is based on eating foods that are minimally processed, free of artificial ingredients and as close to their natural form as possible. You may be wondering, how would clean eating help me? Our bodies have a built-in detoxification system. For it to work efficiently we have to support it through good nutrition. Clean eating via the consumption of whole foods helps rid the body of toxins and can help improve overall health. Choose whole foods that are close to their natural state. Eat balanced meals that include lean protein, whole grains and plenty of fruits and vegetables. The gastrointestinal tract is the first line of defense against ingested chemicals, and a healthy gut flora provides a protective barrier inside the intestine to prevent toxins from entering the bloodstream. Keep your gut healthy by boosting probiotic intake with foods such as yogurt, kefir or sauerkraut, or discuss probiotic supplement options with your dietitian. Increase antioxidant intake by eating five to nine servings of colorful fruits and vegetables every day – the richer the pigment, the more phytonutrients the plant contains. The liver is responsible for 75% of the body’s detoxification. To help support your liver, consume a wide variety of fruits and vegetables including fresh, frozen, dried and canned varieties. Canned fruits and veggies are canned or frozen within three to four hours of being picked which helps to maintain their nutrient density. Read the nutrition facts panel to avoid added salt and sugars. Be sure to choose “No Salt Added” and “No Sugar Added” or “100% Juice” versions. Don’t skip meals, and stay hydrated to help the kidneys clear water-soluble toxins out of the body. Choose fresh foods, or packaged foods with simple ingredients. Shop for high fiber foods since both insoluble and soluble fiber aid in the elimination of toxins from the body. Fiber is found in plant foods, so if you consume plenty of fruits and veggies and shop for high fiber breads and cereals that offer at least three grams of fiber per serving, you will easily meet your fiber goal of 25 grams per day. The best way to start making changes in eating habits is by focusing on one small change at a time. Talk to your Coborn’s Registered Dietitians to get nutrition recommendations that will help you meet your individual health and wellness goals. Happy New Year! Wishing you health and wellness in 2017!